Bookride: Ballet. 104 Photographs. Brodovitch, 1945. Alexey Brodovitch. BALLET: 104 PHOTOGRAPHS. Augustin, NY 1945. Legendary photobook. Text by Edwin Denby. 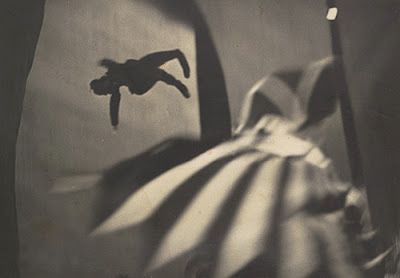 Rare collection of Brodovitch's photographs of Ballets Russes de Monte Carlo from the 1930s. Kerry Purcell said of it --'one of the most successful attempts at suggesting motion in photography, and certainly one of the most cinematic and dynamic photobooks ever published.' Using a 35mm Contax he developed techniques of blurring and graininess that would become mainstream in the 1950s and 60s. AB (1898-1971) Russian born photographer designer, started his career in France and in US ran the highly influential Design Laboratory, producing what is sometimes said to be the century's best design magazine Portfolio (1950 to 1951, 3 issues only.) As Art Director at Harpers Bazaar he ruled the roost amongst NY's fashionistas and snappers for about 20 years from 1934 to 1958, coldshouldering Diane Arbus and promoting Art Kane, Penn, Platt Lynes etc., When he was dismissed and later after the death of his wife Nina, he hit the bottle. There is a celebrated portrait of him (left) on crutches after a fall, by his close friend Avedon. 'Ballet' produced in 500 copies was his only book. VALUE? Seldom shows up on the web but has appeared at auction in NY, mostly at Swann photo sales where between 1997 and 2002 it made $1200 to as high as $3500 for jacketed copies. A copy surfaced at Christies (d/w not wonderful) in London 2006 somewhat over-catalogued; it seems to have worked, the buyer having had to pay £2160 ($4000) to get it home. Some photos by him Ballet (Boutique Fantasque) 1935-37 made between $20K and $45K each at Swann in NY but with a few bought in at $8000 or less, so a valuable but volatile market. A couple of not fine issues of his Portfolio at between $500 and $800, the latter with with the publisher's original stereoscopic glasses laid in, are listed at present but no Ballet 104. The book in nice shape would probably go higher than its recent record because it is uncommon,less common than the 500 limitation would suggest - presumably many being held by costive collectors. I have one of these for sale on ebay right now ... do you know where I could find some of these collectors that might want it?